This pub was voted as one of the best in Walthamstow by Londonist readers. The Bell presides over its ancient crossroads with an imposing, late-Victorian glower. It's a real ding-dong of a building whose facade includes showy gables, glazed tiles and terra-cotta. The pub predates the current 1900 premises, however. Over the decades, the Bell has found itself scrapping with the nearby Rose and Crown, though the relationship is now amicable. Both places are excellent. 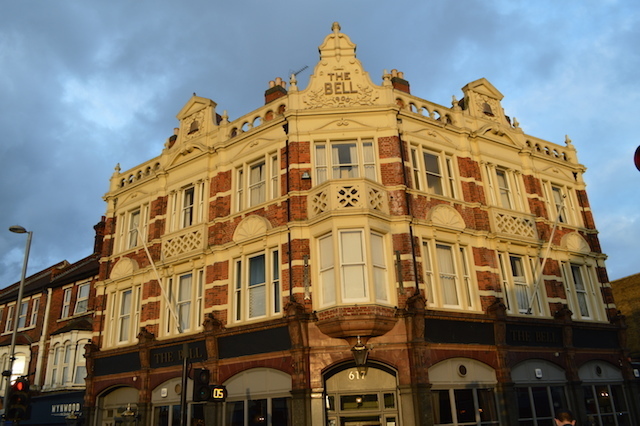 The Bell was closed down a few years ago, falling to a siege of bailiffs while a handful of determined patrons quaffed one last final pint behind barricaded doors. 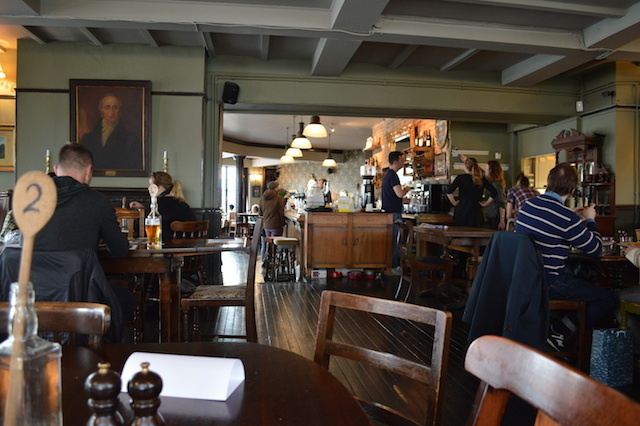 It reopened under new owners in 2012, with previous experience at the White Hart, Stoke Newington. It appears to be thriving. With eight ales on tap, four of which we'd never heard of, this can only be a good thing. Our visit coincided with Saturday lunch, when every table (in a sizeable pub) was taken — mostly with young families. Evenings are reportedly a more adult affair. Quiz night is Tuesday. Jazz every third Sunday of the month. On Twitter as @Bell_E17. On Facebook. 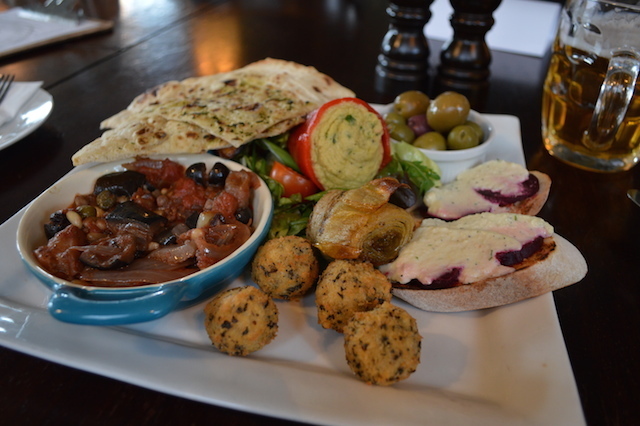 The vegetarian board. Lots of balls and humus. Lovely, though. Glowing in the late afternoon sun.